The sculpture of Yuanmou Man (Homo erectus yuanmouensis) in Yunan, China. Teeth of Yuanmou Man, unearthed in 1965. Yuanmou Man is known as the earliest Homo erectus in China. In May of 1965, The Chinese Academy Of Geological Sciences found the archaeological site near the village of Nabang village in Yuanmou country, Yunnan Province was located on the edge of the Yuanmou Basin. The basin exposed a set of 695 meters thick river and lake facies deposit. From the bottom to the top, the sediment is divided into four sections consisting of twenty-eight layers. 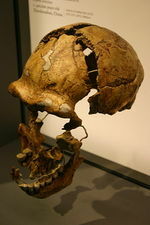 Yuanmou man’s teeth were found in the twenty-two layers of the fourth section. After this discovery, at the same section as well as the same layer, archeologists excavated a small amount of stoneware, a large number of carbon debris and mammal fossils. 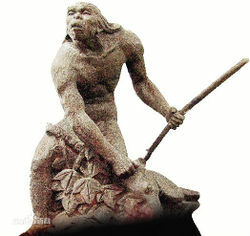 The geological age of Yuanmou man is early Pleistocene. According to Archaeomagnetic dating, the age can be determined to be 1.7 million years ago. The fossil of Yuanmou Man includes two medial incisors with one on the left and another one on the right; these two incisors belong to the same adult individual. The corona dentis is integrated, but the top of dedendum is broken. The surface of the teeth has some small cracks that were filled with brown clay. The teeth are very thick and the facies labialis("Vestibular surface of anterior tooth that contacts vestibular surface of upper or lower lips") (The Free Dictionary) is relatively flat. The model of the facies labials was extremely complex showing its obvious pristine nature. The carbon bits were found by archaeologists, and it was discovered that they were mixed with clay and silt clay, with a small amount of gravel lens. Carbon bits are roughly divided into three layers, and the distance between each layer was 30 to 50 CM. Charcoal dust is commonly associated with mammal fossils. In addition, the largest carbon crumbs can approximately up to 15 mm in diameter, the smaller ones usually around 1 mm. The age of Yuanmou man is Late Miocene. 1965 Fang Qian and Yuqing Pu, along with other scholars, went to the vicinity of the village to search for fossils. Under the guidance of an old cowherd, they headed to the valley which was one kilometer west of the Bang Village to look for fossils. At 5 p.m., one man from this group found a fossil of Yunnan horse and then found two hominoid incisors. After thorough excavation, the scholars brought the tooth fossils back to Beijing. 1972(Feb) Chengzhi Hu who was from the Chinese Academy of Geological Sciences identified the fossils, and he announced this discovery in the first issue of "Journal of Geology" in 1973. The title of this article was The fossil of ape man's teeth founded in Yuanmou, Yunnan. 1973(Oct) Chinese Academy of Sciences Gujizhui Animal And Gurenlei Institute (the Institute of Vertebrate Paleontology and Paleoanthropology of the Chinese Academy of Sciences) organized a large-scale excavation. They discovered some artificial chipped stone tools, carbon dust, and some mammal fossils near the former stratum, but no new human-like fossils were found. Cast of tools used by Yuanmou Man were found in China, and they are displayed in Shanghai Natural History Museum. In 1973, archeologists unearthed three stone implement in the Yuanmou Man’s physic stratum. Also, they collected three pieces of stone tools at the same location. It was predicted that the rain washed these three out of the ground. The first three pieces of tools which made in quartz rock were scrapers. One of the three was a two-blade scraper manufactured with gallet. According to the artificial processing trace on the tool, Yuanmou Man would be used for hitting and smashing things in order to repair them. The second one is a multi-blade scraper made of small stones. Three sides of this tool also had artificial marks. The third one is a sharp-bladed scraper which is also made with little rocks. Tools that been collected: One of them is Lithic core. The lithic core is around 90 millimeters spindle-shaped. The second one is a Lithic flake. The raw material made of this lithic fade is red sandstone (verrucano). The third one is a sharp-pointed device that is made of quartz rock. This picture shows the skull a Upper Cave Man and the tools from them. Different locations: Peking Man was found in the upper cave near Beijing; Yuanmou Man was found on the Northwestern hill in Clam village in Yuanmou County, Yunnan Province. From the appearance: According to the incisors fossil of Yuanmou Man, the inside part of the incisors is very thick, with a distinct primitive character. On the contrary, Peking Man had the low forehead, thick brow, wide, flat nose, and prominent mouth. Their heads were slightly forward which contributed to characteristics similar to the ape. The Upper Cave Man looked similar to a modern human. Utilizing tools: Yuanmou Man had already manufactured some coarse tools and known to use fire; Due to the obvious specialization of feet and hands, Peking Man could create rough stone tools, knew how to use fire, and save tinder. They also learned to use fire for lighting, protection against cold, and chasing the beasts and animals that affected their ability to adapt to nature. The Upper Cave Man were masters of polishing and drilling technology, and they could sew clothes with bone needles. They lived relying on collecting food, hunting, and fishing. This video mainly talked about Yuanmou Man in Tulin Forest. Because the language narrator spoke was Korean, people may set the language of the subtitle below this video to automatical translation to English. Christian educator, Chris Ashcraft, lectured about examining ape-man including Homo erectus to argue about human evolution. ↑ The historical site of Yuanmou Man People's government of Yuanmou County. Web. Accessed December 31, 2016. ↑ Preliminary study on the age of Yuanmou man by palaeomagnetic technique. ‘'Pubmed.com. Web. last-accessed January 5, 2016. ↑ facies labialis dentis. ‘'Farlex Partner Medical Dictionary. Web. last-accessed January 7, 2016. ↑ YUANMOU ‘’East Asian Index. Web.last-accessed - January 3, 2017. ↑ quartz vein ‘’Merriam-webster. Web. last-accessed - January 10, 2017. ↑ Taxonomy, age and environment status of the Yuanmou hominoids Springerlink. Web. March, 2016. ↑ The Origin of Man ‘’China.org.cn’’. Web. last-accessed January 3, 2017. ↑ Compare and contrast Yuanmou Man and Peking Man Baiduzhidao. Web. Published September 1 2016. ↑ Creationist Arguments: Homo erectus ‘’Talkorigins.com. Web. last-accessed January 4, 2017. ↑ Homo erectus refutes human evolution ‘'Evolution dismantle. Web. last-accessed January 4, 2017. ↑ Anderson, Daniel Putting chimpanzees, ‘hominids’, and humans in their proper place ‘'Creation.com. Web. Published July 18, 2007. ↑ Bowden, Malcolm[Homo Erectus —A Fabricated Class of 'Ape-Men'] Tech.J., vol3, 1988 page 152-153. This page was last modified on 23 January 2017, at 13:35.